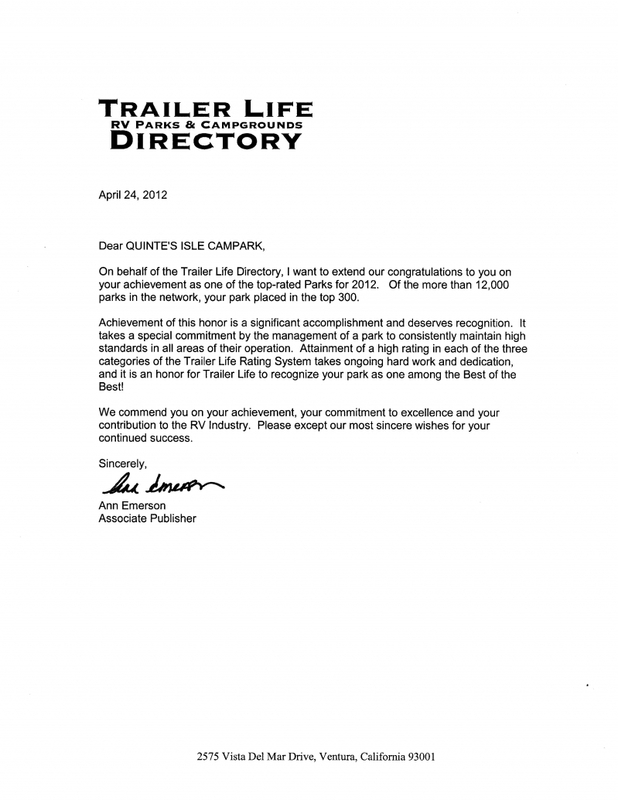 Read the award from Trailer Life Magazine. 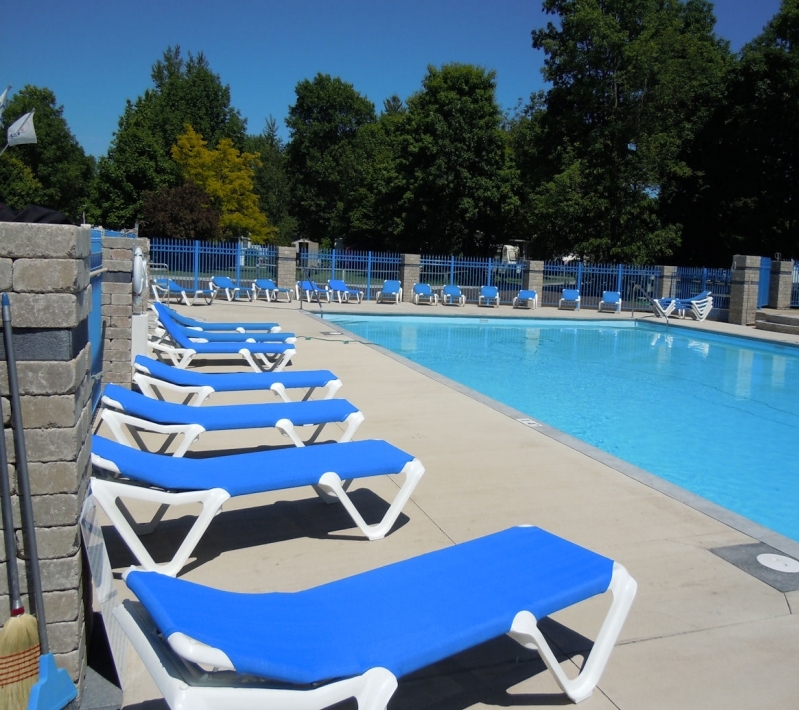 Quinte's Isle Campark was purchased by Victor & Jennie Ward and family in 1983 and continues to be owned and operated by the Ward family today. Through a quarter of century ownership, we have achieved many milestones. 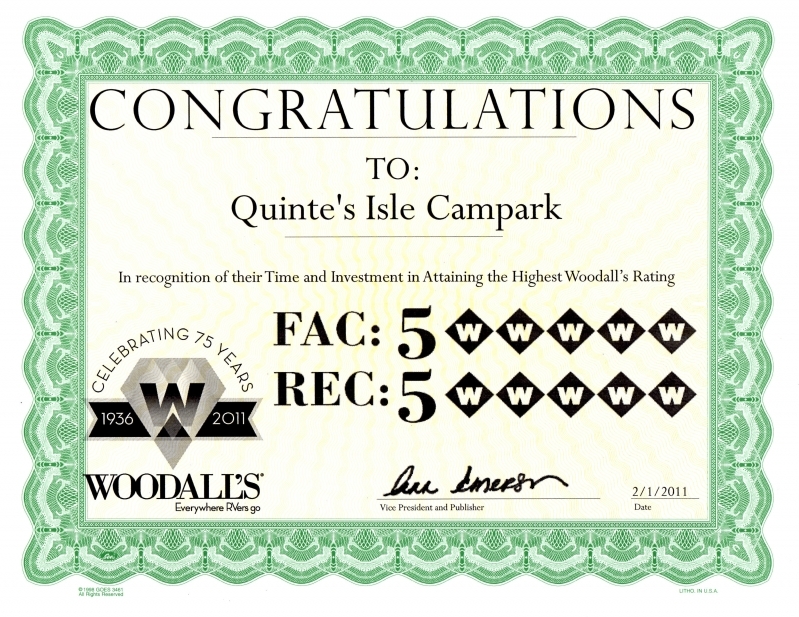 To name a few, Quinte's Isle Campark is rated as a double 5 Star campground, placing us within the top 1.5% of campgrounds in North America. 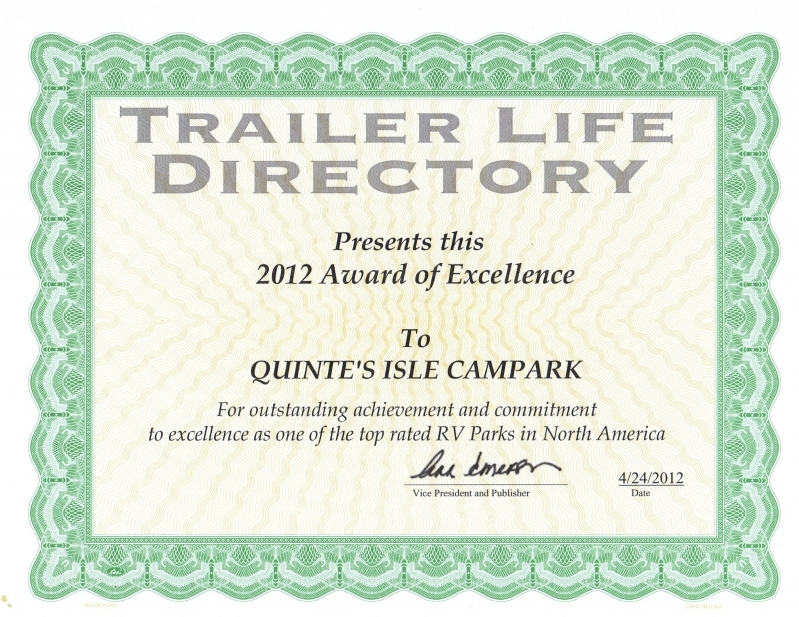 In 2008, Quinte's Isle Campark has been ranked in the top 21 camping parks in North America ("Best of the Best") by Trailer Life Magazine. 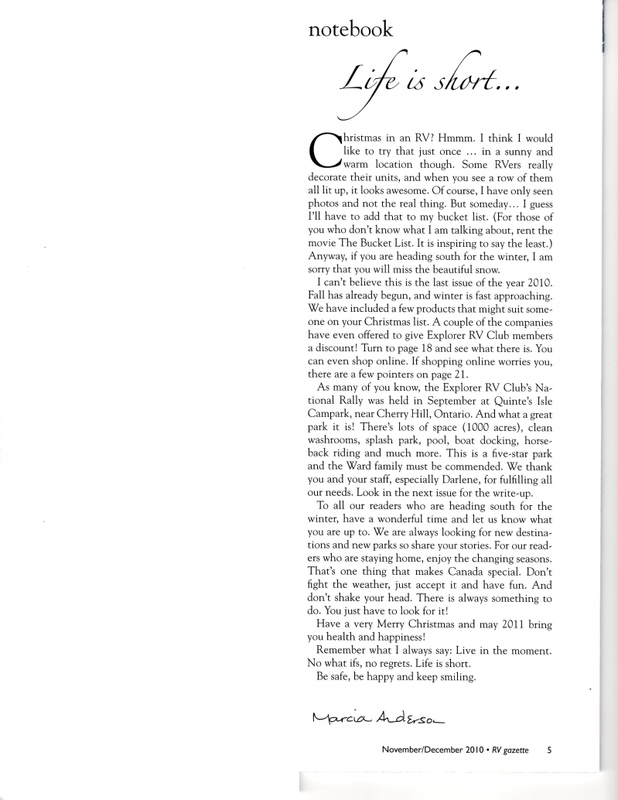 Over the years Quinte's Isle Campark has been improving to meet our discerning customer needs in a changing industry. In 1992 we expanded into new park model and sunroom sales. Our dedication to customer service and satisfaction has made us one of the leading park model and sunroom dealerships in Ontario. (1) The original park is a combination of serviced and unserviced transient sites and seasonal sites consisting of park model cottages and trailers. (2) Limestone Acres North is a park model development located in the heart of our 1000 acre property and features vast open vistas, old growth maple sugar bush and large spacious lots. This area offers you the highest quality Northlander Park Models available. Our package include a minimum 5,400 square foot site, landscaped lot, lighted street post, cement pad, 12' x 12' vinyl garden shed colour matched also on cement pad. This area provides recreational use with an extended season. (3) Limestone Acres South is our newest park model development. 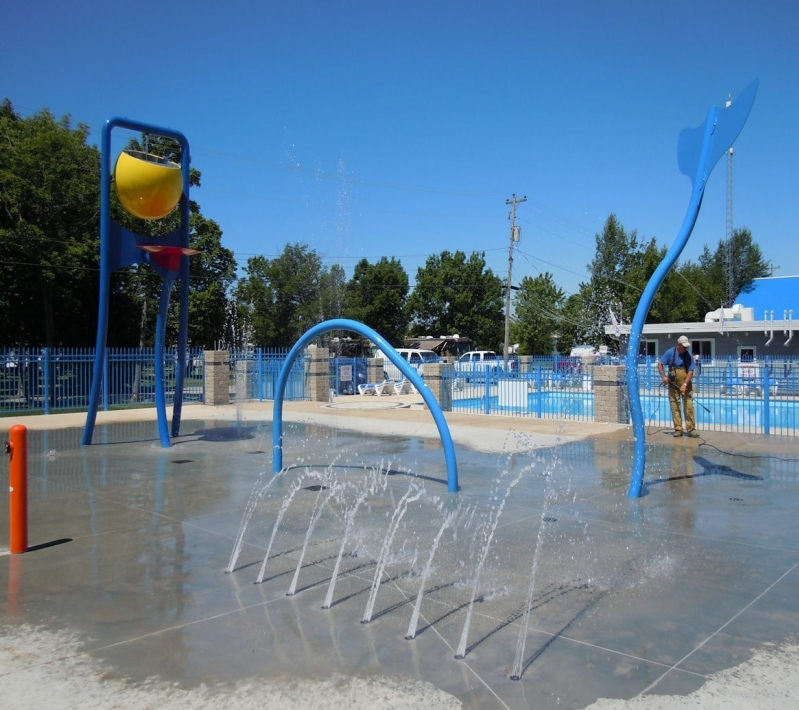 This area consists of modern services for your park model including wireless internet service. This area offers you the highest quality Northlander Park Models available. Our package includes a minimum 5,400 square foot site, landscaped lot, street lights, 10' x 10' vinyl garden shed colour matched on a cement pad. Limestone South is ideally suited as an affordable cottage development. 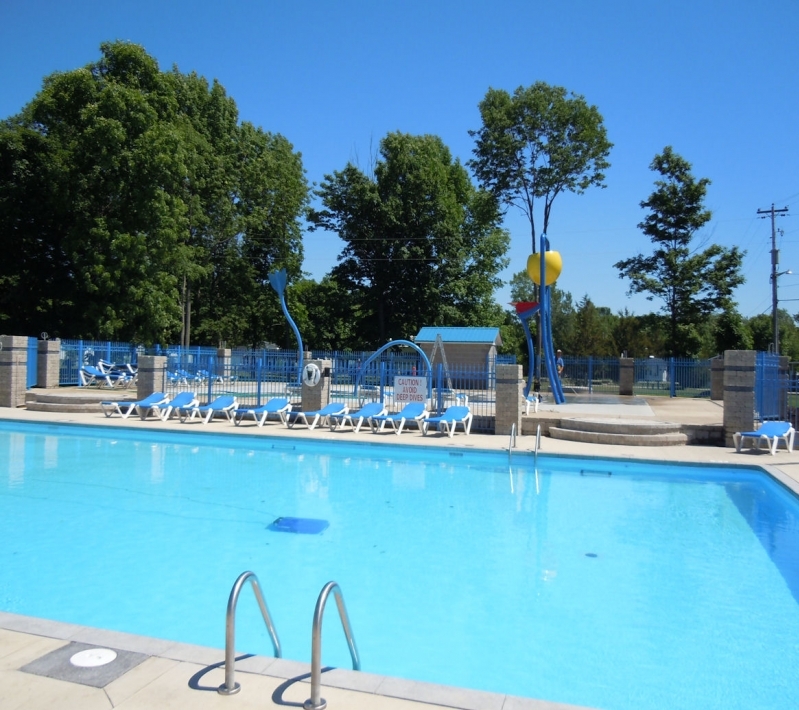 (4) Pebble Beach East "camping at the lake" is an exciting area where our new Pebble Beach harbour and 1 mile of Lake Ontario waterfront is located. 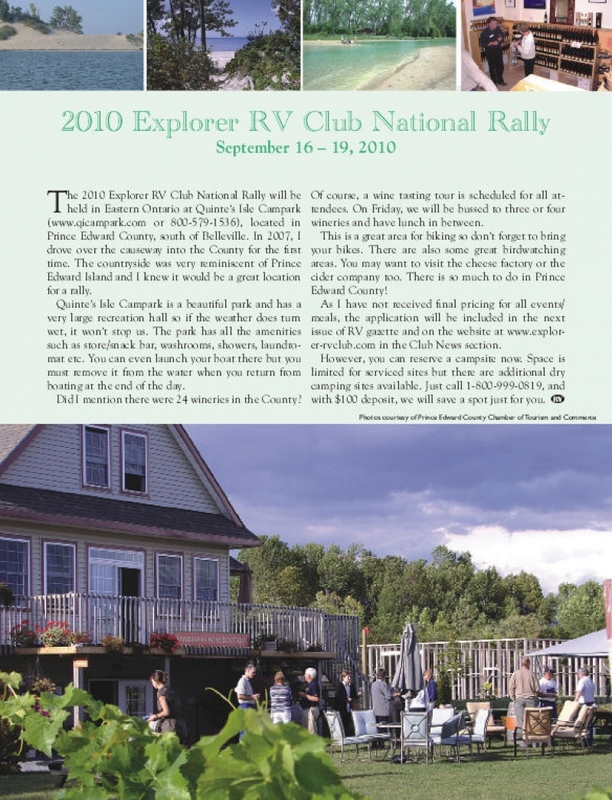 This is a rustic area of camping with spectacular views of Lake Ontario. This area is ideally suited for the campers looking for nature. You can camp facing the water or tucked away in the treed cul-de-sacs on large lots. As of July 1, 2015 there are 58 pull thru campsites, with 50,30,20 amp electrical, water and sewer service at each site.